More than 250 attendees gathered in Columbus, Ohio from October 5-8 to attend the inaugural Bioproducts World Showcase and Conference. This event was hosted by OBIC Bioproducts Innovation Center at The Ohio State University. Dennis Hall, OBIC Director welcomed attendees for the momentous occasion and shared why OBIC felt the need to create this conference to bring attention to the bioproducts industry. The first annual Bioproducts Innovation of the Year finalists presented to three judges in the categories of commercial and consumer. Winners for both categories were announced during kickoff. Teknor Apex was announced as the winner for the commercial category for the Terraloy Bioplastic (PLA for injection molding) biobased product and Cenergy USA won the consumer category for Magic Dirt. There were 24 submissions submitted and OBIC would like to congratulate both the winners and all finalists for their successes. Throughout the three days, there were 16 education sessions ranging from green buildings to biobased chemicals and manufacturing, and marketing biobased to greening pro sports. Attendees were able to learn from these leading representatives in the bioproducts industry. As well, there were eight mini session speakers who were able to speak to the showcase crowd. To help showcase the bioproducts industry, there were 41 exhibitors who participated in the showcase. The Office Depot pavilion provided a row of businesses associated with selling products at Office Depot including Bio Fiber Solutions International who produces 100% biobased office paper. Emery Oleochemicals showed off a biobased car with OBIC’s Sustainable World Tour exhibiting their biovan and the initiative to educate consumers about bioproducts. Entrepreneur Alley provided 14 start-up companies to showcase their biobased products. Whether a tailgate in a box or biobased eating utensils, these exhibitors are helping to innovate the bioproducts industry. Bioproducts World Showcase and Conference was made possible by 11 sponsors of the inaugural event. United States Secretary of Agriculture, Tom Vilsack served as our special speaker for this inaugural event with a crowd of more than 150 in attendance. “I’m back in the business among people who are creating and innovating. It’s what America was founded on,” said Vilsack. Before taking the stage, Vilsack and his staffers walked around the showcase visiting with exhibitors and collecting biobased sample products. When Vilsack described the bioproducts industry, “It’s a new economy, it’s a new way of doing business and it’s an exciting opportunity,” he said. Other keynote speakers included Yalmaz Siddiqui from Office Depot. He served as the kickoff speaker where he spoke about 10 provocations to consider with bioproduct industry. Christophe Luguel, Bio Based Industries Consortium (BIC) board member spoke about Europe’s biobased industry and Alfred Puchala, Capitol Peak Asset Management spoke about public and private partnerships. Cynthia Flanigan of Ford closed the inaugural event talking about how Ford uses various biobased products in their vehicles. We challenge you to #GoBiobased and use in your own social media. This conference is meant to educate and promote the bioproducts industry to the general public and now is our chance to continue these efforts. 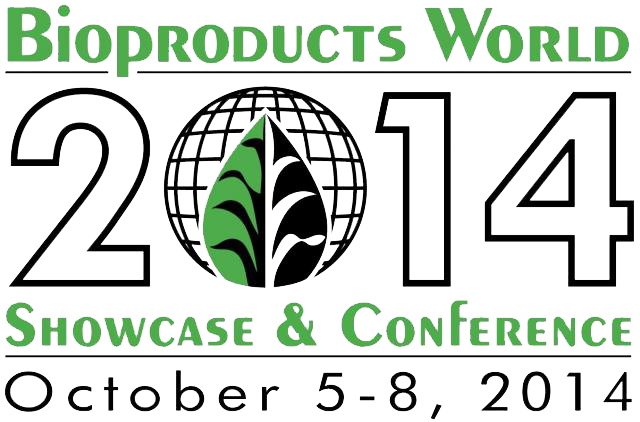 We hope to see you at the 2015 Bioproducts World Showcase and Conference!